Connect your Thunderbolt™ 3 enabled computer to external USB 3.1 (Gen 2) devices using this Thunderbolt 3 to PCIe USB 3.1 adapter. Providing up to 10Gbps throughput, the adapter offers four USB 3.1 ports on two independent bus channels, an additional TB3 port, and a DisplayPort output. 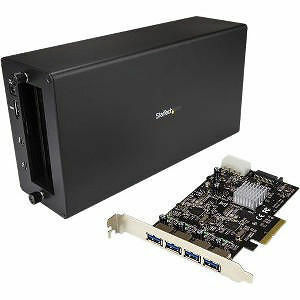 The adapter combines the StarTech.com USB 3.1 PCIe card (PEXUSB314A2V) and the TB3 chassis (TB31PCIEX16). With two host controller chipsets, shared across two ports instead of four, this 4-port Thunderbolt 3 to USB 3.1 adapter dedicates up to 10Gbps for each set of two USB ports. It reduces performance bottlenecks and doubles your total available bandwidth to 20Gbps. Thunderbolt 3 is the fastest connection available. By avoiding performance bottlenecks, you can accomplish more in the same amount of time. With 40Gbps of throughput and support for other high-performance PCIe cards, you can swap the card in and out, to add the peripherals you need connected to a Thunderbolt 3 desktop or laptop computer. Requiring only a Phillips type screwdriver, this Thunderbolt 3 to PCIe USB 3.1 adapter can be assembled and connected in minutes. The TB31PCIEX16 and PEXUSB314A2V are backed by a StarTech.com 2-year warranty.